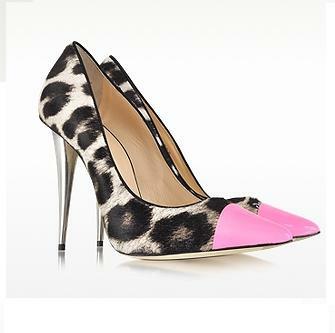 Giuseppe Zanotti Leopard Animal Print Pump is crafted in printed haircalf leather with a stiletto heel for a sleek form. Featuring pointed toe with bright leather cap, silver heel and leather sole. Made in Italy. Amaze yourself with the Giuseppe Zanotti shoes and sneakers collection and explore the most popular Fall/Winter 2014-2015 styles from this authentic icon of Italian designer fashion. The Giuseppe Zanotti label narrates a glamorous shoes story made of women’s sandals, legendary high heels and wedge sneakers up to sophisticated men’s shoes and luxury sneakers in a curated edit at our online showcase. Giuseppe Zanotti is a true star in Italian shoes design, nominated “Designer of the Year” three times by Fairchild. Before winning the “Prix d’Excellence de la Mode” for the best footwear collection by Marie Claire International in 2010, Giuseppe Zanotti started his fashion career in 1980’s as a freelance. His first shoes collection made of sandals was presented in New York and in 2000 he opened his first boutique in Milan. Only the most unique shoes creations could emerge from the eclectic personality of Giuseppe Zanotti. From wedge sneakers for women and high-top leather sneakers for men both sporting the brand signature double zip to coveted red carpet heeled sandals and glamorous boots, all constructed by the finest shoes craftsmen with an artist’s touch. The inevitable passion of Zanotti for his footwear, shared by international stars and fashion addicts alike, has contributed to his great success.